Take our high speed catamaran ferry, the "Fast Cat" to The Dry Tortugas National Park, 70 miles west of Key West. 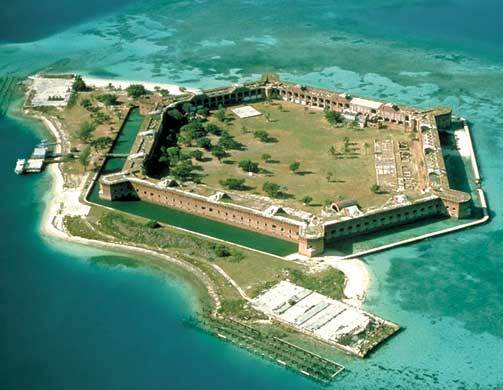 Explore historic Fort Jefferson, America's largest coastal fort. The Dry Tortugas is one of the most inaccessible National Parks. Don't miss the opportunity to visit this remote treasure. The "Caribbean Spirit" is our new sailing catamaran. Offering half day snorkel trips to the living coral reef in The Florida Keys Marine Sanctuary, as well as nightly sunset sails. The "Reef Express" offers visitors more snorkeling time at two locations in The Florida Keys Marine Sanctuary. Half day trips and snorkel/sunset combos. Dolphin Tours - Hop aboard as we travel to the beautiful Key West backcountry to watch dolphin in their natural habitat. Cruzan Cat - The newest catamaran in the Sunny Days Catamarans fleet! This 43' power catamaran offers a fast and stable twenty minute trip to the coral reef. Great for small groups that want a private trip.